I suggest 3 - 3.5 hours. It took me just under three but I had completed some of the belt work with the mk3 guide earlier. 3 hours 15 minutes for me. It took me 5.5 hours, but this is my first 3D Printer. I went slow, to make sure I got everything right. I’m glad extra hardware was included. The screw bag had a hole in it. I lost one of the nuts (I was able to find the screws). I needed a bit over 2h, but i have to mention i have a background in Mechatronics so may be 3-4h are a good suggestion. 1hr 45min according to my video timestamps. I have assembled a MK3 with the old extruder design before, however this was a MK3S. Took me 4h05m but I was only able to work in 40 minutes/day, so some of that time was spent getting the project out and putting it away each session. I went slowly and took my time, checking my work carefully. Pretty sure about 4 hours.. pay attention to the square nut insertion, as much as I thought I was paying attention, I missed putting one in completely, which ended up in a disorganized dissasembly/assembly process. Hopefully did not miss anything. Recommend taking another look with each nut insertion and doublecheck yourself. Yikes…. 3-4 hours and a five out of five difficulty…. I think I will go to the gym and walk my dog first… mental preparation. This is the most important and hardest chapter, take your time, don't rush. Properly assembled extruder is essential. The bag with fasteners includes M3x20 and M3x18 screws make sure you won't mix them! Pay attention to the instructions, when to use the M3x20. Keep the magnets apart in a sufficient distance. They can break each other! The hotend for MK3S needs a shorter PTFE tube compared to the MK3 (more info here). The PTFE tube is already installed, MK3S compatible hotend is marked with an yellow/orange dot on the heater block. Pay great attention to the cable management, if you miss some important step you would need to disassemble the extruder. This bag includes extra fasteners. Don't worry if you finish with few unused screws and nuts. To share my concern. I’m used to standard when it comes to fastener sizes. M3x20 is the machine screw that is slightly longer then m3x18 by about 1/16 of an inch. So the emphasis of separation is important. I hope that helps someone else that this gave pause to. What size is the steel ball? Keep a close eye on parts before hand. My kit had 4 M3x18 screws and only 1 M3x20 screw (luckily there’s spares!). The “PRUSA CHEATSHEET” v1.00 paper reference does not have the M3x20 size screws shown (included with the MK3s kit). It would be handy to add it. Yes, sorry for that. Thanks for reporting this! If the magnets can damage each other, why are they shipped in the same bag? They are usually already attached to each other when packed inside the bag. The damage might occur when the magnets attract and slam into each other. No risk of that when they are already touching, but once apart it’s best to keep them out of each other’s “range”. I finished this section with 2x M3x10s, 2x M3x18 and one 1x M3n left over. I was just about to go through each step and count what was used..
2x M3x10s, 2x M3x18 and one 1x M3n left over. I inventory the hardware bag so I know if I have the correct amount for every step. What I don’t know (without a lot of extra work) is what parts are supposed to be left over at the end. Having a spare parts bag was a hugely excellent idea but this instance of having a “few unused screws and nuts” .. No..
note taken. It’s simply that we prefer to include some more screws rather than risking that some screw will be missing. “The hotend for MK3S needs shorter PTFE tube.” Could this be worded more clearly? I see a PTFE tube sticking out of the hot end. Is it too long and will need shortening later?? Or is this informational only, saying the MK3S tube is shorter than the MK3 tube? The shorter PTFE tube is included in the Hotend in the MK3S kit. The PTFE tube must be changed if you have old MK3 Hotend and doing the upgrade on the MK3S. It is info for customers. The list continues in the next step. Adapter printer and fs lever are not in a bag for 5. E-axis. In case your kids are fetching parts bags for you. Just to point out that the CheatSheet have M3 x 20 Bolt drawing 20mm from the top of the head to the end of the screw. That should not be. Shoulder screw are measure from under the head to the end of the screw to my knowledge. Might be the print i have V1.02 and its scale . I did separated the 20mm with seeing the longest one and confirm on the sheet but doesn’t look right so grab the galiper ;o) a few spot check on the sheet don’t match might not be 1:1.. Maybe use a ruler in doute… Hope it help Happy Building! We’ve noticed an error with the scale and will fix the cheat sheet shortly. Extruder-body (1x) in in a different bag than Adapter-printer (1x) and FS-lever (1x). All 3 parts should be put in the same bag. Luckily I reread the comments before I stopped and asked CS for replacement parts…. Dear Dave, these small parts are sorted separately because they are small, and also because they are not included in the MMU2S upgrade (they are not needed there). Keep magnets together util you are gonna use them. They’re attracted to anything ferrous. One important add on to Miguel: LEAVE THE MAGNETS ALONE until you’re going to use them. I separated mine then set them down a few inches apart and they slammed together snapping the long one in half. Thank the almighty Josef there are spare parts! Take two M3nS nuts and insert them in the Extruder-body. Make sure both are all the way in. Ensure correct alignment using the Allen key. Secure the nut using an M3x10 screw. Tighten the screw just slightly, later on we need to add the P.I.N.D.A. sensor. Take two M3n nuts and insert them in. Use the screw pulling technique. Take the smaller magnet (10x6x2) and insert it carefully in the FS-lever. Majority of the magnet will be hidden inside the printed part. It may help to have a sharp knife to hand for this step. I had to cut some excess material away from the PINDA clamp. Step 8 of the Introduction. Be careful with the hexagon nuts on this part… they fit with a lot of interference within the plastic part. If you use the Josef Prusa, method of assembly nut you may end with the bolt and nut screwed with the hole of the nut deformed to a point that the nut will turn when turning the bolt. If that happens try to force the nut not to move with the plier, if you can’t grab it (like me) insert a thin pointed metallic object between the plastic parte and the nut, just to try to fixit after securing the nut try to unscrew the bolt. if you are successful, glue the bolt on the hole. By the time you reach the point you have to use that bolt with a screw the nut may be already glued to the plastic part. Had the same problem here. A friend is reprinting the piece for me because it was beyond repair… Should have read the online manual instead of the handbook to read the comments. My advice: avoid the screw pulling method for this part! Heads up, several people needed to undo part of their work once they got to Step 42, because the picture here in Step 5 makes it look like the square nut on the left should be flush (not pushed all the way in). “Ensure correct alignment using the Allen key” is important here. Read the comments in Step 42 for details! Thank you for saving people a load of time Dan! Be sure to put in the top middle M3n nut fully seated (it will sits in much further than picture show) to avoid having to address it later as many have noted in step 42. It will save time and the hassle of being back here to push that M3n nut fully (which is a bit misleading based only on the picture). be careful with the part where the pinda sensor goes in, when i was trying to align the square nut with the allan key, it snapped the plastic part. i have hopefully fixed this with plastic glue, how long this will hold up remains to be seen. Yeh made sure to only get glue in one place and not on any moving part, as it turns out the left fan doesn’t spin yet so may have to redo the extruder and then the nut for the fs cover will go in and i wont need to glue it lol. See the two M3n nuts which are not square nuts? When I tried to service the E axis assembly later, one of them started rotating together with the screw and I couldn’t take the screw out anymore. I had to tear down the entire assembly and had to break the piece in the end. This can be avoided with square nuts. Really make sure to get all nuts in at this stage, triple check if you must, because later there is a step when screwing the fs cover on, if that nut isn’t there you’ll have to go back 40 steps not joking lol. my Nut, Bolt', and Extruder Body are fused together for all of eternity, and since this is my first 3d printer I can’t just print a new one.. Can somebody please print me a new one? We managed to grind off the head of the bolt with a power sander and push out the screw and nut with only minimal cracking of the part, so with fingers crossed we’ll be trying to print a new extruder body with a cracked and slightly melted one. dear God please let this work. Make sure you used the M3-10 for the purple step! I accidentally used an M14 and was looking all over for it in a later step! I had a problem inserting one of the M3nS. I did not want to break the body by pushing it too hard on the table. Took another M3nS and it worked like a charm. As Josef mentioned: tolerances! When inserting the M3nS nut (between the two holes specifically) push it all the WAY IN! As others have said, this is crucial, I got to step 42 and had to read back to here to realize my mistake. Fortunately Laurel W - March 11 comment on Step 42 shows good steps to correct for this. Posting this to try to highlight this to Prusa to update this step with a bold warning. Well, it is not in bold letters, but the step does say: “Make sure both are all the way in.” and “Ensure correct alignment using the Allen key.” there’s even Josefs’ avatar, is that not enough? Insert the FS-lever in the body. Secure the part with a M3x18. Tighten it, but ensure the lever can move freely. WARNING: make sure the following procedure is done right, otherwise the filament sensor won't work!!! Correct setup: magnets are repelling each other, thus the lever is pushed to the right. Incorrect setup: magnets are attracting each other, thus the lever is pulled to the left. Careful! Since the magnets are arranged to repel each other and the smaller magnet’s groove on my unit was loose, the smaller magnet literally flew across the room when I let go of it. I had to add the smaller magnet only just before step 14 and use a piece of filament to hold it down until the cover was attached to keep everything in place. How did you use a piece of filament to hold it down? What I did to fix it was cut a little piece of plastic, from the big packing material that was in the box, and squeeze it into the hole with the magnet, which made it fit snugly, and I then trimmed edges carefully with a hobby knife. Hi Peter, sorry to hear that. It’s a neodymium magnet, the dimensions are 2x6x20 mm. You should be able to find suitable replacement in your local hardware store. Yep, happened to me, too. (But there are spare magnets in the upgrade set). Prusa should improve the design of the FS-lever: If the magnet is inserted from the other side it would be fixed together with the FS-lever and there is no risk that it jumped out. I had the issue of the magnet flying out but was fortunate that it didn’t break. I stuck a piece of masking tape on one side of the smaller magnet to add a bit of friction which held it in the socket. Used super glue to fix the small magnet. Tip: Rotate the larger magnet on the outside of the assemble near the slot where it goes until it repels the smaller magnet in order to find the correct orientation before inserting it into it’s slot. Would you recommend actually gluing the small magnet inside the part so it doesn’t fly out? Hey Fabien, please follow the manual closely - I suggest you don’t do any additional steps that aren’t mentioned in it unless you’re absolutely sure about it. I also was unable to complete this step as described because the small magnet insisted on flying out of its slot and attaching itself to the larger magnet. I kept the big magnet in the sd card case it came in, and set the smaller one to the side. When it came time to insert he big magnet, I made sure I knew which side was the repelling side (did it through the plastic case). That way when I inserted it, there was no attraction, and no risk of the small magnet flying out and sticking. I wrapped the magnets in one layer scotch tape to prevent them flying out of there slots…. I had the Flying Magnet problem and cut the bottom corner of one of the polythene parts bags out to make a little cover for the smaller magnet, which kept everything in place. Otherwise I could not get it to stay in there. Big Magnet, although loose, doesn’t want to somersault. Put your thumb over the smaller magnet while inserting the bigger one. The FS lever in the photo appears to sit nicely and lie flush with the surrounding surface. Mine sits 1.5mm proud. The surfaces seem clean so it looks to me as if it is intended to be like this but it doesn’t match the manual photo. Is this important ? Hello Bernard, it’s just the angle of the photo. The lever will not be flush with the surrounding surface and that’s ok.
Got to say….. the idea of using the magnets is pretty clever. As long as your small magnet is in tight, you shouldn’t have an issue with the magnet flying out. Take the printed part Adapter-printer and insert the steel ball in. Roll with the ball to all sides to ensure smooth movement. In case of any rough surface, remove the ball and clean the inside of the printed part. Place the printer part together with the steel ball in the Extruder-body. The surfaces of both parts should be almost aligned. DON'T use any screw to secure the Adapter-printer. It should hold inside the Extruder-body by itself. Are we supposed to secure the printer-part adapter with a M3-10? Hi Cory, no need for a screw. Instructions updated. So the M3x10 in step 4 is not used yet. Correct? Hello Bruce, that is correct. I thought it was used in step 5. My upgrade kit (mk3 to mk3s) didn’t come with this “adapter-printer“ part.. instead it had 2 “FS-Lever“.. oh well. I’m printing it now. I don’t have black though, so it’s grey, hope that doesn’t affect the sensor performance. Hi there, we’re sorry for the inconvenience! Please write me an email to info@prusa3d.com. ATTENTION: there is a set of the Bondtech gears. Make sure you have all the parts and you are using correct ones. Use now: Bondtech gear with a grub screw. If the screw is out, gently screw it in (leave space inside for the shaft). I only have one of those black bearings shown in the red square! LOL found it! it was inside one of the Bondtech gears! Whew! I don’t think it is too clever to put the magnets into the same bag as the Bondtech-stuff. It was hard to seperate as all parts always got attracted. I almost lost the tiny spare allen screw. I would suggest putting the Bondtech parts into its own bag. Thank you for the feedback, we will look into making adjustments to the packing. Re: the Feb 16 entry, my kit came with the 2’nd Bondtech fully pre-assembled with both bearings and the shaft. Took me a second to figure out, but hopefully a time-saver later on. it would also be good on this bond tech to specify that the lock screw is a “grub” screw, to minimize confusion. same as the pulleys in previous steps. Thank you for the suggestion, we will look into adding a note about the distinction between regular and grub screws. The last servo motor in the box is labeled “Y axis”. Will that still work as the “Extruder” motor? I double checked all of the other motors and they were all correctly labeled as: Y axis, X axis, Z axis left, Z axis right. There are 2 “Y axis” motors in the box but they have different cable lengths. I can see that all the servo motors are the same model. Just want to make sure the Extruder motor model is the same as the rest. Hi Darrell, the cable will be too short. Please contact our support if you received a wrong motor, we’ll send you the correct one. Take the Extruder-motor-plate and secure it using two M3x10 screws. Use the cable as a guide to properly orient the part. Rotate the shaft as in the picture. Flat part must in the direction of the arrow. Slide the gear on the shaft, the grub screw must be facing against the flat part of the shaft. Tighten the screw slightly. There is a "channel" for the filament inside the printed part. Align approximately the teeth on the gear with it. Don't tighten the screw just yet. We will align it properly first. See the next step. Don’t do what I did. That set screw can easily be lost in a carpet xD. try searching for it with the magnets? It doesn’t look like both sides of the extruder motor plate filament “channel” are at the same depth. It is hard to align the teeth on the extruder gear when your reference on either side are at different levels. It might be helpful to add a note on the correct orientation of the motor wires. I had to come back to this step after I noticed in step 14 my wires were misaligned. I’m not sure what are you referring to - motor wires are clearly visible on both pictures in this step. The screw on the shaft is stucked because the Allen key is turning in the screw!I didn’t use any glue and I didn’t tighten the screw. Impossible for me to continue to the step ten! I’m screwed! @Adrien If you are talking about the set screw, try using a torx bit, they can often be used on stripped hex screws. If that doesn’t work, you can try using a drill bit to drive the screw all the way through (with the gear off the shaft) taking care not to damage the threads. A new set screw should be easy to source locally. The bag with the gears had a setscrew loose in the bag, but the gear had another setscrew already in it (intended as a spare perhaps?) At first I thought the setscrew had shattered, but no, it’s just exceedingly tiny. I put the spare in the plastic case that held the magnets. which part is the “teeth”. Is it the longer grills at the top, or the smaller ones at the bottom. Hello Ravish, see the second photo. Align the small embedded teeth. For the “channel alignment”, it’s helpful to bring the assembly up to eye level and look down it like a sight. Then you can clearly see how the high/low the gear on the shaft should be. Take a piece of the 1.75 filament. You can use the bundled one on a spool, don't use the black nylon, which is too thick. Straighten the filament as much as possible. Place the filament along the path and align the gear properly. The filament will be always slightly bent. Use it anyway for the initial alignment. For a final check replace the filament with an Allen key. Bear in mind, the key has slightly different size than the filament. Tighten the screw slightly to temporarily fix it, we will make the final check and tightening later on. Be careful, you can strip the thread. Don't use any glue to fix the screw in place, you won't be able to release it, in such case you might have to replace the entire motor. No tightening of the gear screw in this step? Hi Martin, it is assumed the screw is tightened from the previous step, retighten it if needed. Final check will be done later on. Be very careful using the Allen key for the final alignment check: it is very easy to deform the printed part. Make sure you’re using an Allen key that is slightly thinner than the filament. The left side is slightly higher than the right from this angle, looks that way in photos as well so I’m assuming that’s the design. Slide the nut all the way in. Leave the second slot empty, we will use it later. Question - why is the first picture showing a nut resting on all top of the black printed part? It was confusing as it seemed to suggest the nut was to be installed there. Maybe update the picture (it’s not like the other steps)? Thanks. Hello Adrian, it is to show which nut to prepare for this step. As the second picture shows you, you hve to insert it into the hole. My extruder-cover arrived broken. Will the missing chunk effect my prints? Hey Peter, it shouldn’t affect anything. You can re-print the part later. Can I print it in PLA? Also, where do I find the models? My bad! I totally forgot to link them. You’re looking for the MK3S Extruder Cover. It shouldn’t be printed with PLA - it must be able to withstand heat. PETG is the best choice, you can also use ABS. "MK3S ready" hotend is marked with an orange/yellow dot on the heater block. If yours differ contact our support immediately! We will use one M3x40 later on, keep it around. Don't cut the main zip tie on the hotend cables, or remove the rubber band, it will make the assembly easier. What’s the difference between a “MK3S Ready” hontend and a) a MK3 hotend, or b) a standard E3D V6 hotend? Mine came with a rubber band around the cable instead of a zip tie. Good thinking, it prevents cutting the wrong one. Thanks, I was starting to think I hadn’t gotten one because I was looking for “hotend” on all the various parts diagrams and boxes. Hello guys, thanks for pointing this out. If it causes confusion, we will check if it can be changed. Please measure the length of your PTFE tube. If it’s 45mm, then you can proceed with the build. If it’s 50mm, then you’ll need to shorten & trim it (How to trim PTFE tube - Multi Material) or use one of the spares that you got with MK3S. If others made the same observation, perhaps worthy of reconsidering. Otherwise, please kindly disregard. If there are only two possible dot colors (green or orange/yellow) then probably not worth addressing. Hey Todd, we’ll add a note about it. Thanks for the heads up. I noticed that there is no collet clip on top of the heatsink as shown on the E3d online hotend assembly guide I assume the collet clip is not necessary ? Hello, as long as the black collet is lifted up and the PTFE tube sits firmly in the hotend and not moving, the collet clip is not necessary. But if you feel like having it, you can print it, the model is available on thingiverse. I think the assembly instructions are really great but this remark is really strange. Where will the screws be used? How many? I finally used the M3x40 in step 22 but I still have an M3x10. It is disturbing to think I might have missed using it somewhere. Totally agree with this. This chapter is not as professional or succinct as some of the others — the extra parts, for instance, should be in the spare parts bag, so that completing this whole chapter leaves you (ideally) with no extra parts. Remarks like this are confusing in a chapter whose preface is so insistent on careful precision and close attention to the directions. Looking back from a few steps down…I guess this means one of the three M3x40 screws gets used a little farther down the line? I still don’t quite get it, but I got through step 14 and only used two of those three screws, and it seems like I’ve now moved on to another piece. Okay, confirming the last of these three M3x40 bolts is used in step 22. Wow. That’s really unclear. We will look into changing this note to be more clear about the M3x40 screw for Step 22. I’m confused; I’ve gotten to this step (upgrading from MK3 to MK3S) and my extruder doesn’t have any dot. What does that mean? I’m in need of a new Hotend for my MK3S, but I don’t see this part available for purchase on the Prusa site. How can I get one shipped to me please? Hi Chad, make sure you are logged in - otherwise you won’t see the spare parts section. Hi, what is the spare part number for the ‘‘Hotend for MK3S ‘‘. Can i buy it on Amazon? Hello, here is the link to the inline store: https://shop.prusa3d.com/en/mk3-and-mk3s... We do not recommend buying the hotend from elsewhere! Take two M3x10 screws and insert them in the holes. Doing this now makes the assembly slightly easier, but both holes are shallow and the screws might fall out. If this happens, you can continue without them and put them back later on (you will be noticed). Also note, that in few upcoming pictures the screws might be missing. Hotend assembly was completely reworked from MK3 to avoid bad placement. Also any future maintenance is much easier. Place the hotend next to the Extruder-body, see the grooves in the printed part, which are in the shape of the hotend. Correctly placed hotend. Cables should point in the direction behind the hand, we will align them in the next step. Insert the two 3x10mm screws on the lower part of the cooling shroud before you put the extruder in place. You can see on of the holes between the fins of the barrel. I couldn’t get them to go in strait on step 19 without taking it apart again. I agree. The two 3x10 mm screws should be inserted at this step. Great hint! Insert the screws now! Hey guys, thanks for the suggestion, we’ll consider this. Hello Dan, yes, that is the reason. But you sure can insert them at this step. Even that this is not common, but for me the lockring was broken and one piece was blocking the PTFE tube. So, adding a check for the good tube stickout hight might be of help here. If something arrived broken, then please contact our customer support - we’ll send you replacements. The next step shows better where the wires should go. In order to protect the hotend cables and ensure proper orientation, it is highly recommended to use a box. Use the one provided in the kit. Place the Extruder-body with the hotend on the box and make sure the cables are pointing down. Place your finger temporarily on the longer magnet and place the extruder motor assembly on the Extruder-body. The Bondtech gear might pull the magnet out while assembling parts together. Make sure both parts are aligned. Place the Extruder-cover on the Extruder-body. Again, make sure parts are properly aligned. Insert two M3x40 screws, you've prepared earlier. Tighten them, but be careful, they are slightly longer, than the thickness of the entire assembly. Place the extruder aside for few steps, we need to prepare another part. Leave it on the box to prevent damaging the cables. Slightly longer? Try 12mm of bolt will protrude from the body instead - be specific (or even say about 1/2”). Whoops, I left part of the extruder off, now they only protrude slightly. If they stick out too far, you have done the same as me. They now protrude 3.5mm after correcting my mistake. Yep, made that mistake too, thanks for writing, missed that whole “Place the Extruder Cover on the body part” . Your post made it easier for me to find and correct it..
it is shown in the picture but it’s easily overlooked. even when i had the pspare bit in my hand it took me 10 minutes to find out where i’d missed this step. Worse for me - I stripped one of the nuts inside the body so the 40mm screw was stuck. I had to dremel the bolt out. This got hot and slightly warped the extruder body. PLEASE Prusa add a bit more warning to this step in the next revision. I’m pleased to see I’m not the only mupet who can’t follow instructions but so many places in the manual you highlighted stuff - this needs extra pic/and warning please!!! Same thing happened to me too. Mounting the extruder cover really should be its own step. Like Tony, I also stripped not one, but both nuts on the long bolts. Not sure how I did that. I also had to cut them off with a dremel. To prevent melting the plastic too badly, I dabbed a Q-tip in water and applied it after a few seconds of cutting to cool the bolt. Seemed to work alright. Also, thank god there were plenty of extra M3x40 screws! I didn’t look at the picture closely enough. When I read “make sure the cables are pointing down”, I oriented the hotend with the wires exiting straight downward. I didn’t notice til step 36 that the hotend was 90º off axis! Fortunately, I was able to loosen the assembly enough to make the correction without taking the whole thing apart! I made the same mistake… Where it said “make sure the cables are pointing down.” I incorrectly assumed that meant make sure the cable outlets face down. This appears not to be the case. So in order to not get to this step and have to disassemble, at step 14, make sure the cable outlets face to your left and the cables hang down otherwise you won’t realise your mistake until step 36. In step 13 we get three m3x40 screws out and then only use two of them? The third one is used in Step 22 for securing the IR sensor in place. Prusa, please fix these directions. That’s a huge number of steps to go by after “preparing” a screw, including context-switching to assembling a different section of the whole assembly. That’s a good way to lose parts for those of us who take out those needed for each section and set them aside. You do not need to keep the screw in your hand all the time - you can set it aside for the assembly time, it shouldn’t get lost. If you’re worried about losing the screw, then consider purchasing a magnetic tray to safely store it at all times. When screwing the extruder cover onto the extruder body, make sure the two shorter screws you placed from step 13 aren’t wedged against the heat sink. Because of the way the parts are sitting on the box, these two screws can get pushed up and jammed against the heat sink, making them impossible to screw in later. Make sure these two screws can be turned before proceeding to the next step. Thanks for pointing this out — you definitely saved me some time. My screws were firmly wedged against the heatsink, and could not be pushed in. However, I was able to use the rounded allen key to turn them at an angle and they dropped back past the heatsink and into the holes nicely. Glad I addressed that now. Prua - Please add an extra picture or warning to rember the Place the Extruder-cover it’s really easily overlooked and causes damage to the other parts if forgotten here. Hey Tony, have a look at picture #3 - it shows the extruder cover. It’s also mentioned in the Step’s description. Check for interference between the PTFE tube and the Bondtech gear mounted on the extruder motor. If there is interference, remove the PTFE tube from the hot end and trim the end of the tube that is inserted into the hotend. Reinsert PTFE tube into hotend and check again for interference. Repeat until there is no interference between PTFE tube and Bondtech gear. read all the comments, and then still managed to forget to add the cover part. went through a few more steps until I realized it, and by that time the plastic the nut is in, was totally destroyed by me trying to tighten the screw… had to dremel the screw, and now I dont know what to do with a part where the nut dont grip.. Prusa forget about the box, this part here is the one thats critical, and needs to be in bold red font. or maybe a seperate step. good point, Nelson. I was going to just leave the excess there. Now I will take it apart and trim the PTFE tube until there is no interference with the Bondtech gear. Thanks! Got to step 36 and realized I didn’t follow this step properly. Please show a direct bottom view facing the extruder nozzle to show that the heater block orientation. Basing the orientation on the wiring is confusing. Use the heater block + wire routing direction. Hello Kevin, the block’s orientation is clearly visible on all pictures. If needed, you can always click on the magnifying glass to enlarge them. Where’s m3x40 used for these steps? It should be in one of the plastic bags. See the labels. For the following nut insertion USE A SCREW. THAT'S AN ORDER!!! Seriously, use a screw to pull the nuts in, both have to be properly seated in the X-carriage. Take both M3n nuts and using pliers (or screw) push them in the X-carriage, then using a screw from the other side, pull them all the way in. Don't forget to remove the screw. Take all four M3nS nuts and insert them in. Ensure correct alignment using the Allen key. From now on, keep in mind the nuts are inside, avoid rotating the X-carriage "downwards", or the nuts might fall out. I was 2 x square captive 3mm nuts short here. I suspect that I have put the missing nuts in the Extruder assembly, since there were some no longer needed screws there. I have raided the spares bag. Belay that last comment (I just found them, sorry). Is the 40mm screw referenced in step 16 just to pull the M3n nuts into position? I don’t see where it’s used in the next few steps. Hi William, it will be used in step 22.
these nuts were really a bear for me to get in. i ended up taking a hammer and tapping on an m3x40 bolt with the nut threaded to get it to seat properly. Next time, we recommend taking a smallter screw and use it to pull the nut into the socket by screwing it. See the Introduction chapter. The M18s worked perfectly for me as well. I spent about 2 hours trying to get the nuts seated using the procedure outlined in the introduction. Very difficult! Here’s what I used to get these in: I took the M3x40 and ran it through, threaded the nut onto it, and pulled it down into the “trench.” I gave it a firm pull to seat it into the opening that it needs to go into, then I unscrewed the M3x40 (since it is not fully threaded) and used an M3x10 to tighten the nut into it’s proper position. Worked like a charm. The nuts wouldn’t fit in even pulling strongly on the M3x40 from the other side. Here is a quick super-efficient way (not sure it is approved by Prusa Officials though!). After taking the M3x40, run it through and thread the nut onto it (as instructed), heat the nut with a lighter so it gets real hot. Then pull down gently in place. Worked perfectly :) Warning : don’t pull too much or the printed part will be ruined! You’re right, although it’s quite creative solution, we would not advise it in the manuals, as using this method can be destructive to the printed parts irreversibly - it could be problematic if you were to do any reassembly in the future with the nut/screws permanently ‘melted in’ the plastic part. Use an m3x14 or m3x18, push it all the way in. Set the nut on top, hold with one finger, and turn the screw from the other side. Seated easily. I couldn’t pull the nut in enough with a screw from the other side, it would pop out as soon as I unscrewed the pulling screw. What I did before unscrewing the pulling screw, is I put another screw from the top the wrong way (so the wider part is touching the nut), and used it as a makeshift hammer, lightlghy tapping from the top with a real hammer until the screw got in enough so it stays put when unscrewing the pulling screw. 1. Put an M3x18 screw through the hole from the other side. 2. Put the nut on the M3x18 and screw it down a few threads. 5. Now, use an allen key to tighten the M3x18 screw. This is were people get confused I think. It is the tightening of the M3x18 screw that actually pulls the nut in. Just screwing won’t accomplish much. Tighten the screw and once the nut is in place, you may unscrew the M3x18 again. Why go to the trouble of the red text and red avatar if you’re then immediately going to say “using pliers (or screw)” ???? Modify the directions to advise against pliers, they’re more likely to damage the printed part. I managed to strip thee threads on the nut while pulling it through with a screw. Then damaged the printed part trying to rectify the situation. What are my options? Hey Fred, you can either glue the nut inside the hole, or re-print the part. If everything else fails, you can always purchase the part directly from us. Thanks for your prompt response, Filip. Where are the files for printing? Also how do I order a new part? I think I’d like to have original equipment. Hello, you can get the 3d model here: https://www.prusa3d.com/prusa-i3-printab... or search for the part in our e-shop. Keep in mind that in order to see the spare parts, you have to be logged into the account that you have used to buy the printer. Thanks, Martin. I downloaded the file and ordered a new part. Take the IR-sensor cable and locate the end with the smaller connector. Place cable in the X-carriage, use the small printed overhangs to keep the cable inside. The distance between the connector and the X-carriage should be around 15 mm (0.6 inch). We will adjust it later. Guide the cable through the slot, remember this path, we will use it for other cables as well. Given that some of the square captive nuts do fall out when you turn the X carriage over, this step would be better before the nuts are put in. Hi David, the cable will most probably fall out while assembling the nuts. They don’t fall out if you keep the part upright, where the nuts won’t fall out. Following cable management is CRUCIAL for the extruder TO WORK PROPERLY! Read the instructions carefully. Start by making a small loop just below the extruder motor. Leave a slack about 2-3 cm (0.8 - 1.2 inch) This is comes handy for easier disassembly in the future. Then guide the cable in the "channel" all the way to the back. Slightly bend the cable down to form it around the edge. Also, prepare X-carriage, both M3x10 screws (if you haven't used them already) and the longest Allen key with the ball-end, you will need it. DO THIS ON STEP 13. It’s easier that way, just slip them in the hole and let them sit till stip 19. Also, when they say make a loop, don’t actually make a loop. It will take up too much of the slack, and you will get to the very final step like I’m at and realize that you have to take the whole thing apart again. It is possible to do a loop later, but you need to realize that the loop is necessary. I had the same issue as Matt, don’t leave too much slack! Make a pretty small loop. 3 cm is about 1.2 inches, not 1.6 inches. I’m going to assume the metric is correct for the loop length. The exact size of the loop does not matter all that much, as long as it’s around 1 inch. But yes we’ll correct this. Before you assemble the X-carriage, check the nuts in the Extruder body are still in place. The upper nut sometimes falls out. Grab the X-carriage and place it from the back of the extruder. Make sure the motor cable follows the channel both in Extruder-body and X-carriage. In the X-carriage the motor cable will follow the path of the IR-sensor cable. ENSURE NO WIRE IS PINCHED! Then use the M3x10 screw and Allen key with ball end to connect both parts together. If you are inserting the screw at this moment, it will be slightly inclined in the beginning, but it will "straighten up" after few turns. Don't tighten the screw completely, we need to adjust the IR-sensor cable. Turn the extruder to the other side and if needed insert the second M3x10 screw. Don't tighten the screw, we need to adjust the IR-sensor cable. After this step, I temporarily lashed the hotend wiring to the X-carriage with a ziptie to avoid bending the wiring around. I left the tail on the ziptie to remind myself to remove it again later. Step 19: Could not get the screws in once assembled so had to un-assemble, put the screws in before the extruder and then reassemble. The two 10mm’s should be inserted on step 14 before the extruder. Using the ball end of the allen wrench the screws went in fine. Agree that 2 10’s should go in earlier. Had to undo previous work. Using the ball end on the allen wrench, the 10mm screws went in at an angle at first, and then engaged the nuts and straightened out, just as outlined in the step. Yes, as many have said before, insert the 10mm screws in Step 13. Way easier! They also help to align as you put the pieces together, which is one less thing to worry about since your hands are very busy keeping the wires in the right positions. I agree with Vadim D, maybe the best approach would be just invert in the project the nut and screw position and the screws would be easily tight from the back. that might be true, but the goal here is to make the potentianl disassembly of the estruder as easy as possible. BE CAREFUL with the filament sensor, do not touch the black PCB nor the chips on it. Hold the PCB from sides. I don’t see the M2x8 screw on the Cheat Sheet. Fortunately, I figured out it was the smallest one in the bag. Hi Ken, the M2x8 screw should be on the bag label, the cheatsheet will be updated soon. You might want to point out in the diagram what part of the sensor is the “black PCB” that isn’t supposed to be touched. With the little chip-board itself being black it wasn’t obvious to me. Thanks for the heads up, we’ll make it more clear. Why in this step does it show that black clip on the board and then it disappears in the other photos as I can’t complete step 42 now with it! Help! I’m not sure what problem do you have with that step. Please contact our tech support for advice, or have a look at step 21. I had the same question as Sarah. Like her, I installed the board upside down at first. :) Sarah, eventually the filament will travel through the black “clip”. For me, it was counterintuitive to install the board with the chips facing down. Fortunately it is easy to turn over and fix the problem! Sensor is the last thing checked during the selftest, so you can simply ignore it and run XYZ & first layer calibration manually from the Calibration Menu. I didn’t read ahead to notice not to touch the chip board, so mine has been touched as well. Is there a way to safely clean it or order a new one? Just continue the assembly and see if the printer passes the Selftest. If not, you can order a new sensor in the online store. (You just have to be logged in). Watching the Self Test take place I see nothing about the filament sensor being checked. My printer won’t autoload the filament so I suspect there’s a problem with the sensor. Could you advise what sort of voltages I might expect to see on the sensor pins in the on and off state please? Thanks! unfortunately, the voltage on the sensor is not a good indicator. Update to the latest firmware and then go to Support - Sensor info, to see how the filament sensor reacts. Then contacts at info@prusa3d.com and send us a photo of the screen. Thanks for that Martin, should’ve gone for the obvious solution I suppose. It looks like the magnet loaded arm is sticking slightly and not retracting properly when the filament is removed. A fun hour of dismantling ahead! Appreciate the very rapid response. I have it working now and appreciate how much easier it is to get to the extruder with the new design! I found that putting a thin nylon washer behind the FS lever (step 6) helped with its free movement. Place the IR-sensor on the top of the Extruder-body and secure it with the M2x8. Make sure the black plastic "u-shaped" part is facing down. Connect the cable, mind the correct orientation of the connector and wires. Leave a slack behind the sensor like in the picture. Don't create too big loop as it might interfere with the frame. If needed adjust the length by gently pulling/pushing the cable. Ready? Ok, check once more no cable is pinched and tighten both M3x10 screws installed previously. Here is an easy tip to use. Cut open the anti static package that contains the PCB sensor (DO NOT REMOVE IT FROM THE PACKAGE). By holding it inside the open edge of the package you can hook it up to the wire connector and then by holding the connector you can put it in place without ever touching the PCB sensor at all. I hope this can help others. super-like this advice, John H.
Consider using an anti-static wrist strap for this step. Also, it’d be nice if the directions suggested a method for ensuring cables are not pinched. For me, it was as simple as checking the free movement of the cable sliding through the channel before plugging it into the IR sensor, but the instructions given might be more nebulous for some people who do not have any experience with cable management. Finish the sensor assembly by inserting an M3x40 screw. Make sure all the gaps are gone. Jesus, that whole assembly was so tense. Glad I finished that with confidence that I correctly followed the directions. Make sure you are using the correct screws. Keep the cable in a bundle for now. I have a totally different looking fan in my kit. the fan I have is enclosed and has a shoot coming out of one end. it has the following printed on it: PRSUA Research Print Fan 5v pruas3d.cz. Sorry, So Sorry, I found the correct fan motor. I did not explore the box thoroughly and overlooked the second fan. I do not need another fan. Sorry for wasting you time with my stupid mistake. I’ll try to do better. Could (probably is) be my mistake, but looks like I’ve only got two of the M3x14 screws left from the bits for this step. Grabbed one from the spares bag. For easier fan installation, remove temporarily the black wire from the cable bundle and release at least one loop. Then tie the bundle back, see the picture. Before you move to the next step, take an Allen key and GENTLY PUSH the motor cable to the channel to create space for the fan cable. I can’t speak for the Queen’s English, but I know in the USA where I grew up, we called these fasteners “twist-ties.” In this case, you might want to call it a “tie” or something similar, since the distinction between “wire” and “cable” is kind of vague. The fan has two sides, one has a Noctua sticker. Make sure, this side is facing inside the extruder. First, create a loop on the cable. Make sure the black protective wrap is close to the edge of the fan. See the picture. Slide the fan close to the X-carriage and GENTLY PUSH the cable in using an Allen key. Before you push the fan all the way to the left, place the cable in the X-carriage channel. FINAL CHECK! The fan is oriented with the cable facing up, then the cable goes through the upper channel all the way to the X-carriage. In the X-carriage don't forget to use both channels. Make sure the CABLE ISN'T PINCHED along the way! I can’t seem to fit the fan cable in the side channel, the motor cable is taking up all of the space. I’ve tried pushing it in with the Allen key, but it isn’t accomplishing much. Any suggestions would be appreciated. Use the three M3x14 screws to fix the fan in place. Don't over tighten them, you can break the fan's plastic casing. Also make sure the fan can rotate freely. Note that the screws are "self-tapping" in the printed parts. There are no nuts. Leave the last hole empty, for now. It would have been helpful to me if you would have said “These screws are just screwing in to plastic so don’t over tighten” rather than saying “Don't over tighten them, you can break the plastic casing. “ I was thinking that there was a nut behind these when I am now pretty sure that it is just a plastic hole that the machine screw is grabbing. Maybe not the best choice of hardware? One of my screws started to spin (much to my surprise) rather than snug up. I took it out and managed to get it to grab adequately on the second attempt. Hey Ken, we’ll add a note about those holes and not using nuts. I couldn’t find the bearings anywhere. Then I figured out that the next step (28) had already been performed prior to shipping out. Should adjust these instructions to accomodate for that. It was at this step that I discovered there was an additional (spare?) lock screw for the locking bondtech gear in the bag. I’m not pleased with all of the spares popping up outside the spares bag. That grub screw is not used in this step, therefore it is not mentioned here. The screw is used in the other bondtech gear that you put on the motor shaft. However, we will look into adding an additional note here. At this step I found a tiny black screw in the bag. Like the one used to fasten the extruder pulley. I hope this is a spare. Or did i miss a step? No worries, there is indeed one spare grub screw in the bag. If you find that a bearing is missing check inside the gears. They can work their way inside during shipping. Take M3n nut and place it in the Extruder-idler. be sure shaft pin is fully seated equally , if its not, the gears may slip and material will not be properly fed to hotend. clicking and slipping may occur. How do I know the shaft pin is fully inserted? It is a very tight fit and doesn’t seem to be in the “right side” (according to pics) deep enough. You can put the shaft “on top” of the part, this will let you see how far it should go before you insert it. Alternatively just compare it with the picture. You can also try pushing it further down with an allen key. So when I proceeded to step 31, I could see/feel the shaft pin impacting the side of the extruder body, so I took the extruder idler assembly back off and forced the shaft pin in deeper until there was about 1mm relief on both ends. I used an Irwin Quick-Grip hand clamp to get the shaft into the idler. It worked really well. Yes Dan about 1mm under flush on both sides of the pin is right. was anyone able to do this with their own hands. I had to use mallet in the end. it broke the part and had to reprint it in PLA and even that was hard to get in. i used the mallet on that too and it fit. I was able to work the shaft most of the way by hand. To center placement of the shaft, I clamped an allen wrench in my workbench vise to use as a punch. Then gently tapped the opposite flange with a light nylon hammer. “Use reasonable force” usually means “a notable amount” rather than “with restraint.” I’d adjust this to say “use a cautious amount of force” instead, or even better just “be careful not to over-tighten and break the printed part” like usual. I pressed the shaft against the workbench to get it all the way in, and then used an M3x40 screw with a rubber mallet to tap the shaft just slightly, so that it was sitting the recommended 1mm inside the opening of both ends. Turns out that while my method was really good, it doesn’t eventually work out if you’re an idiot and put the gear on backwards. Be careful with this step. The shaft is a very tight friction fit. Attempting to push the rod into the printed part actually put a hole in our table. Let's use this opportunity to check once more the proper alignment of the filament and the Bondtech gear. Push the filament from the top, through the Bondtech into the PTFE tube. Check the alignment and if needed, adjust the position. Tighten the screw, but be careful, you can easily strip it. How far in the PTFE tubing should the filament go? That dos not matter. Important is to have the Bondtech gear aligned to it, as shown on the picture. It should be made clear in the instructions about depth! Mine only makes it in by 0.4mm ? My filament doesn’t flow easily into the tube. It actually gets stuck on the edge. I’m not sure what steps to go through to fix this since everything is together. It looks like the shaft is slightly over the opening. Is this okay? Is the filament supposed to easily flow down into the extruder tube? On which edge does it get stuck exactly? In this step we are aligning just the the teeth of the bondtech gear with the inserted filament. After finishing your E axis assembly, the filament should get centered above the PTFE tube after closing and tightening your idler hatch. “You can easily strip it” is referring to the screw’s head rather than the screw’s thread? It’s referring to the head. it seems like the bondtech is pressing into the tube that the filament is supposed to go through… is this correct? if not, how do I fix it? You can contact our tech support - we might have sent you PTFE tube that’s a bit too long. Alternatively you can trim the end of the tube a bit. My tube looked exactly like Julian’s as well. I took the spare PTFE tube, cut 1.7mm from the bottom and re-shaped it. It fits perfectly now. My previous tube was mangled at the top because of this and unloading was not working most of the time without force. I got hung up on this step. My PTFE tube was maybe 0.5 - 1 mm too long so that the bondtech gear pressed down a little bit on the rear side. Because it was not much length, tech support advised me to scrape down the end of the tube with a craft knife until it was not touching the gear. After that, I found that the filament still did not go into the tube - it seemed the front to rear alignment (not the lateral alignment described here) was wrong. But tech support pointed out that installing the idler in the next step will resolve this, so don’t worry about it. The gear is not rotating freely, even when I’m trying to rotate with my finger it’s still not easily rotating. What could be the reason for this and will it be a problem ? Could it be because of over-tightening the screws ? When I putted it on the motor on the motor I checked it and it was rotating freely. Also the filament doesn’t go inside the tube more than 2mm. Indeed, the gear is not supposed to rotate freely. The motor shaft rotates a little, step by step. And the gear is supposed to be firmly tightened against the shaft. It would be nice if this tip was present in the earlier steps when we are tightening this screw since the tolerances are quite small. good point, thanks for the suggestion. I think I stripped mine a bit, however I managed to get i thight again. How will I be able to tell if it is thight enough? The gear seems to rotate with the shaft just fine. Hello Christoph, if the gear rotates with the shaft and does not slip. it’s all good. My PTFE tube seems to be a bit too short. It does not even barely touch the Bondtech gear, as shown in the picture of this step. When using flexible filament, this is always leads to filament tangled around the driven Bondtech gear. The filament i am using is Treed PureFT (Shore A-D: 95-35). - Reduce the press on the springs on hobbled pulleys. Place the Extruder-idler in place and secure it using a M3x40 screw. Don't tighten the screw too firmly, it serves as a shaft for the idler. Check that the idler can rotate freely. I tightened the screw, which kept the door from swinging. I backed the screw out so I could open the door, but friction stopped it moving at the fully open position. I left it there, and backed the screw out until the door dropped closed. Tight enough that it shouldn’t work loose, but loose enough to allow free working of the door. Step 27 said to prepare a M3x40 screw with the spring. I think it should be made more clear that the M3x40 in this step (step 31) is a different one. Either that or have the person ready two M3x40’s back in step 27 (one with a spring, one without). That is what the 2nd picture in 27 shows, and it says to get 2. This is the only part so far that’s been frustrating - when I put the m3X40 screw in, it spins the nut that was previously installed - that chamber is stripped (not the nut but the printed chamber). I did pull the screw through as instructed (and have done that in the past successfully). I will try using a square nut to prevent the spinning, frustrating though. I had the same confusion that Scott Mutton had about the screw with a spring. I missed that two screws were to be prepared. Too hasty in my reading. I need to slow down. The m3x40 screw would not align correctly with the idler door and the rest of the assembly when inserted through the holes so I could not thread it all the way to the end. To correct this I had to drill the hole a little wider on the carriage piece. Use the M3x40 screw with the spring to introduce tension to the Extruder-idler. Hold the Extruder-idler on the other side, until the screw reaches the nut. Since there is only one screw, you need to introduce a large force. The head of the screw, should be aligned or slightly below the surface. I take it we don’t want to bottom out the screw, right? With the head just below the surface, the spring is not fully compressed, and this is what we want. Is that correct? Hello Clay, yes that is correct. Martin, that doesn’t match what the directions say. It says aligned or just below the surface. Mine can easily go a couple more mm before it bottoms out. Hey Nathan, those few additional millimeters can cause clogging in the future. Make sure it’s not fully bottomed out. Got it, think I read Clay’s response wrong. probably not be a bad idea to check and see if the filament can move freely in/out of the extruder. if it doesn’t you’ve done something wrong. As a side-note, if the spring were wound the opposite way it would act as a bit of a lock-nut. Right now the spring-ends lightly resist tightening, but a reverse wind would cause them to lightly resist loosening. Warning for inattentive people like me - I wasn’t paying attention to the picture and mistakenly put the screw in from the nut side, then applied the large force mentioned in the instructions which ended up turning the nut inside the printed extruder-idler. Sigh. I was still able to fasten it after undoing my mistake, so no permanent damage done I think, but posting this comment in case it helps someone else do the same. Hello! that exactly what happened to me. my problem is that i cant get the screw out anymore because the nut seems to be stuck and turning the screw just also turns the nut. there is no way to get the screw out…. i tried to apply more pulling force while turning out the screw. Nothing worked. O just tried again 10 minutes later and suddenly it worked. lucky me. I like Mike Johnson’s idea as a way to check that you haven’t over-tightened the screw. Prusa should consider adding it as a step. The thing is this technique is not ideal. It can be difficult to pull the filament out yet still the tension can be correct. Is it possible to get a photo of how far the screw protrudes from the nut on the other side at this point? I am trouble shooting some underextrusion on mine and at the point where tension seems good my screw head is further out of the extruder body than this. Hey Keith, have a look at Step 66 - you’ll find the picture there. Thanks! It looks like I may be a few threads too loose still. Take the M3n nut and insert it all the way to the support. It is crucial! Place the support on the extruder and ensure the inclined part is facing "down" (towards the nozzle). Secure the support using an M3x10 screw. The m3n nut cutout on the print-fan-support appears to be too large to retain the nut after inversion. The STL file measures 6.9 mm across while the nut size is 5.4 mm across. I suggest delivering somekind of anti-seize grease with the Stainless steel screws/bolts and nuts because i ruined 2 bolt and nust allready due to seizing. Anti-seize grease is not included, as all nuts and bolts should fit without issue in the printed parts. If you have any problems with the parts received, please don’t hesitate to contact us aboout it through an email to info@prusa3d.com or via our livechat directly. Easiest way to screw this in is from the back, between the printed part and the wires. Also the motor wires are now looping in a different direction than previously shown. The fan-shroud was initially designed for M3x18 screw, but based on the feedback and to make the assembly more convenient, use M3x20. If your extruder bag includes only two M3x20 screws, please use another one from the spare bag. I like the custom support on this shroud. First time I have seen support on a Prusa-supplied STL. Either I am blind or this manual does not state to remove the support from the fan-shroud. I was clueless about it for a few hours as things were not fitting! MK3S-kit here. Insert M3nS nut in the Fan-shroud, all the way in. Mount the Fan-shroud to the extruder, secure it using an M3x20 screw. Don't over tighten the screw, you can break the plastic casing. Also make sure the fan can rotate freely. My M3x18 didn’t quite reach the nut. I ended up grabbing a M3x20 from the spares bag instead and it fit perfectly. 100% agree. This is a job for the M3x20. I thought the M3x18 worked for me but on closer inspection it did not reach the nut. yep, M3x20 fits perfectly. Thanks for the tip! Hey guys. According to our testing (and my own experience), the M3X18 but is long enough. however, It’s true that M3x20 is better. We’ll look into this. For me, the M3X18 is also just slightly too short. It reaches the nut, but doesn’t grab onto it. I’ll use M3X20. I measured the depth needed to thread all the way through the Mn3S and came up with 21.25mm. I used the M3x20 but the threads just barely grab the nut threads. unfortunately the spare kit doesn’t have an M3x25 which would have been a bit long but workable. Hello Tom, Did you count with the screw head going inside of the fan body? From our experience, M3x18 or (M3x20 if you want to be sure) are long enough. I ended up using an M3x23 and it works perfectly. My time is worth £35 an hour, another spool of PLA will equalise your debt. When in doubt, you can always contact our tech support via Live Chat - we will be able to assist you during the assembly. Lol Gavin get over yourself, I read the instructions and never had an issue. Your comment better be a joke or else it’s one of the most pathetic attempts to exploit a company’s generosity I’ve ever seen. Lol totally agree with Rich on that..
Yep. 20mm works here too. Could even be longer and not stick out. 18mm was just barely catching a thread, I wouldn’t trust it. Same for me, the 20mm was needed and it barely threaded flush with the nut. A word of warning: on my MK3S kit, the square nut was a very tight fit into the fan-shroud. So much so, that forcing the nut in cracked the top of the fan-shroud, my first such mishap of the kit. I've cemented the crack with Gorilla Super Glue and I think the part will be functional, even if the glue were to fail. So, don't do as I did --- if the nut doesn't go in easily, pull it out and clear the opening until little force is necessary to get it in. The top part of this fan-shroud is surprisingly fragile. Gotta be super-careful here. I cracked the top of the shroud above the square nut when tightening the bolt. I didn’t even use much force either. I’m still not sure what caused it to crack. I think maybe the nut wasn’t 100% centered in the bolt hole and the M20 screw bottomed out into the plastic just past the nut. Just got back into this after gluing shroud back together. The 18mm screw was the perfect length for me - just one thread shy of coming flush to end of nut. I strongly recommend measuring your stack up if you have calipers. If not, at least start with the 18mm screw and see if it works before switching to the 20mm. Can a replacement part for the fan shroud be printed in PLA? Hi Leonard, no, we definitely don't recommend that. This part is super fragile. Mine was broken out of the box at the corner of one of the output nozzles. Also, my M3x20 didn’t align well with the hole on the inner side and it didn’t screw in fully. I tightened a bit too much and broke the shroud around the square nut, just like Nick. it might be the extruded cover part is designed for the screw to self-tap into it instead of only catching on the square nut of the fan shroud. Some superglue later, I attempted M3x18 and it caught about half the threads in the nut. It’s good enough and i’ll leave it like this instead of risking M3x20 again. Hi Ori, the shroud seems fragile but is in fact quite durable for it’s size, and also very quick & easy to print. You can always re-print it to keep a spare just in case. If it arrived broken, then you can always contact our tech support for replacement. Is loosening and re-tightening the 3 screws in the fan a good way (Søren Madsen’s comment on 2/23) to mitigate these screw length and part breaking issues? Hello Pavel, thanks for your comment, we’ll check this. all hail the spare bag!! There are only 2 m3x20 screws included in the “5. E-AXIS” bag. It’s labeled “2x M3x20.” Step 35 tells you to use one of them, then Step 37 tells you to use 2. Hey Mike, you can always use the spares bag. It isn’t spare parts if it is required. Please fix the kit, add one more M3x20. Hello, the thing is, it is not required, rather “more comfortable”. We are building dozens of printers per day using the shorter screw, no issues. Agree with mike and James. Maybe a quick note stating to get one of the spare m3x20 out of the spare bag… So you should start off with m3x20 (3). 1 for the fan shroud and 2 for this step. Hats off to Prusa for the spare parts bag! You were able to make the minor tweaks with the extra parts on hand. All that has to happen is update the online instructions. You all should eat a few bears! Dave, thanks for your support :) The note has been added. First, slide the fan in the Fan-shroud and make sure it is aligned properly. Second, fix the fan in place using one M3x20 screw. Tighten carefully, or you will damage the fan's casing. Turn the extruder around and insert the M3n nut. No need to pull it in, we will use the screw. Place the remaining M3x20 screw from the other side and tighten it, but carefully, or you will damage the fan's casing. Guide the cable according to the picture in the channel. Bend it slightly towards the extruder. DON'T stretch the cable! I found the second M3x20 screw didn’t line up with the nut, so I backed off the first M3x20mm as well as the M3x20mm from the last step (replacement for the M3x18mm). This allowed the fan shroud to move a little and I could tighten the 2nd screw, then the 1st, then the one from the least step. Agreed, loosening the screw from step 36 was especially helpful for alignment. I mixed up a M3x18mm with my 20mm…made it impossible to attach the last M3 bolt! YES, be sure not to mix 18mm with 20mm!!! I discovered the self-inflicted painful mistake after I had kludged a “solution” by using a spare M3x25mm. Fortunately, an easy correction (unlike some of my other entertaining, stupid mistakes!). Mea culpa. It would be advisable to double check that the fan is inside the fan shroud and not outside just before tightening the second screw. If it’s possible, I would definitely recommend pulling nut into hole before placing fan. I got mine slightly cocked and cross-threaded the screw going in (loosening the first screw would have helped as well as suggested above). Tried to back out the screw and just made the nut spin in the hex hole for it. Now I’m hooped. Look of the sensor might slightly differ. Check there are four wires in the connector, if not, call our support immediately. Insert P.I.N.D.A. sensor in the holder. Exact position doesn't matter, we will adjust it later. Tighten the M3x10 screw, but just slightly. Create a loop on the cable from the sensor. Push the cable in the channel together with the fan cable. the PINDA sensor screws through the assembly, mention of its approx end position (2 or 2mm above nozzle I guess) is CRITICAL before any cable management. Hi Jonathan, PINDA probe position doesn’t matter at this point - it will be adjusted later. The PINDA sensor does not screw through the assembly. It should slip in with no twisting necessary. When I attached this part the screw didn't feel very secure. I don't think there was a nut for it and maybe the plastic got stripped out? there is no screw for this part. The screw is possible to screw to the part below this FS-cover. I am having the same issue. When I insert the screw there is nothing for it to catch and the part doesn’t secure. If I insert filament into the other hole I can feel the ball bearing move. If I insert the screw into the hole with the ball bearing then there is tension. I am unsure if I need to tear it all the way down to check. Hi Tristan, try using a slightly longer screw. If that doesn’t help, then perhaps you forgot to insert the nut during previous assembly steps. This step should be way earlier in the assembly so that the filament sensor is not damaged when handling the extruder through the other steps. Hello, thanks for the suggestion, we will consider it. Place the FS-cover on the extruder and align it according to the picture. Tapered sides of the cover must be oriented towards you. Insert the screw (mind the correct hole) and tighten it. Tip: If you can't reach the nut, try to align it using an Allen key or pulling it up using a longer full-threaded screw from the spare bag. The screw is not tightening . I don’t know if I missed something in the beginning, but I don’t see any nut being inserted that this would grab onto, and it won’t tighten to the printed part beneath (which I think is the Steel Ball assembly). Did I miss something? and is there a way to fix it without taking the entire extruder assembly apart? Hi Matt, looks like you've missed the nut in the step 5, see the blue arrow on the left. You need to separate the Extruder-body and the X-carriage in order to get to that slot. For the users that have the PTFE Tube connection for the MMU, how will step differ? Hey Jared, there will be a separate guide for that. The MMU FS-cover looks slightly different. Perfect, and that is shipping with the upgrade kits? Yes, it will be shipping with MMU2S upgrade. I concur - this would protect the sensor. Ran into the same issue as Matt, there was no nut on the other side. Turns out I had not pushed it in all the way in step 5. You can undo the fan to get access to the screws that mount the x carriage assembly and remove the x carriage assembly just enough to push in the nut the rest of the way. Ended up being not too bad of a mistake. Same exact problem with the same exact solution. Same issue, thanks for the suggestions to fix. Maybe step 5 can be modified to help make this more clear to avoid this issue. I also ran into the same issue has Christopher and Matt. I had the nut inserted in step 5 but I never realized I needed to push it in so far. The picture in step 5 is slightly misleading in that it looks like it just needs to be flush with the surface. Taking the fan apart and accessing the screws to remove the x carriage assembly fixed the problem as they said above. I ran into the same problem as Matt & Christopher. The nut had dropped and the M3x10 wasn’t long enough to engage the threads through the FS-cover. I removed the FS-cover and was able to use the screw pulling technique to seat the nut properly. Put the FS-cover back on and the M3x10 tightened nicely. Same here, had to pull the fan and crack open the extruder to push the nut down. 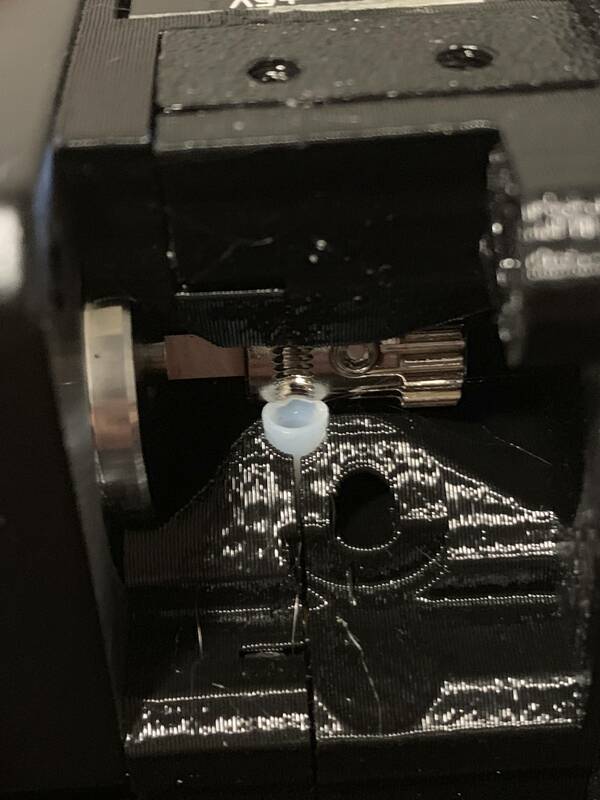 Ok so the screw as shown in the picture wouldn’t catch the thread in the nut, I didn’t get how to seperate the extruder body, so tried the other screw hole which seemed to work. Is it a problem if I use the other screw hole? The M3x10 nut is long enough to hold through the FS cover. Try to clean plastic from debrits. After try to install the FS cover and tighten M3x10. The screw should be sufficient to tighten. Does the filament go through the fs cover is that the reason for the second hole? Hey Shane, one hole is for the filament - the other is for the screw. I’ve used super glue carefully in one corner, away from any screw holes and the little circuit board, in a way so that it stays on but, I can easily take it off should I need to. I wanted to avoid having to go backwards, to other people make sure to get that nut in in step 5 I could have sworn I did it. I’d love to not have to back track as I can’t get my head around how. I ran into this as well - same problem with step 5 lack of clarity. Steps I followed to fix 1) unplug the IR sensor (undoing orange dot step in step 21, IR-sensor assembly). 2) remove all 4 screws attaching the hotend fan, and remove the hotend fan. 3) Loosen the screws right next to the hotend that you tightened partway with the long Allen key in steps 19 (green dot and red dot steps) and completely in step 21 (blue dot steps). 4) Loosen the screws tightened in step 22 (IR sensor assembly) and 31 (pink dot step). For those screws that get loosened, you have to undo them enough to almost come out, but not quite. This will allow you to pull away the x-carriage assembly from the rest of the extruder body. Then you can get at the nut that caused you so much trouble and fully insert it. Mine did not want to go, but I finally got it back in. To close back up, you have to redo the cable management that took so much work in step 19. Then reverse the rest of the steps. Would this step be safer to perform right after installing the sensor? It seems like the protective cover would be good to get on earlier. Hey Keith, it’s usually best to follow the manual - with that cover attached too early you can make some errors. Hey Steve, you can always try to align the nut with the smallest allen key - it should grab it. Insert the zip ties in the X-carriage like in the picture. Lower the X-axis at about 1/3 from the top. Turn the printer like in the picture with X-axis motor and shorter extrusions facing towards you. Align the bearings similarly to the picture. The exact position of the lower bearing doesn't matter for now. Place the extruder on the bearings, the top couple must fit perfectly. Make sure the X-carriage is facing towards you (together with the shorter extrusions). We will adjust the lower bearing later on. Tighten and cut the zip ties. I removed the zip tie that I had temporarily added after step 19 (to keep the hotend wiring from bending) before doing this step. Should read “Lower the Z-axis”. The orientation here is not obvious. The guide should say something about the logo facing away from you when fastening the zips. +1 on this. Not until step 52 photo do you actually get to see to which side you should be mounting this. Clarification needed! Yup, another +1 to this. Hey Jason, we’ll add a note about it. Yes I had the motor on the side without prusa writing/logo. Don’t do that, I managed to correct it without much work, left the belt in orange parts. Then just put it in the x carriage when I’d corrected it. Would be nice with a picture from the side showing how tight we must pull the zip ties. Tighten them fully, the bearings must not move. Do a quick check that the square nuts haven’t fallen out of the assembly before doing the zip ties. After this step, it’s harder to put them back in if they have fallen out..
Place the cables on the P.I.N.D.A. sensor side over the lower smooth rod and push them back in the channel. Place the cables on the hotend fan side over the lower smooth rod and push them back in the channel. Align the bearing, so it fits nicely in the X-carriage. This is probably a good time to finally let all the wires “breath” and take off twisty ties and rubber bands. It’s also not clear that the hot end wires should hang down. They don’t go in the channel on the right. I think the hot end wires drop below the extruder, and do not hang with the rest of the wires on that side, in the image in step 47. Insert the flat part of the X-axis belt into the X-carriage as in the picture. Use a screwdriver or the smallest Allen key to push the belt in. Guide the X-axis belt through the X-end-idler, around the 623h bearing with the housing and back. Continue with the belt through the X-carriage. Guide the X-axis belt through the X-end-motor, around the GT2-16 pulley and back. Before you continue to guide the belt through the X-axis, please release two M3 screws on the X-end. Rotate the X-axis motor as indicated towards the frame. Insert the flat part of the X-GT2 belt into the X-carriage as in the second picture. There will be belt overhang on this side, DON'T TRIM IT yet. Read the first part carefully, I initially read it as “loosen 2 screws”, but you have to completely remove them in order to get that much rotation. They only need to be removed from the motor - they can stay inside the plastic part. Aha, that makes sense now. Thank you. Removing them from the motor did the trick. I believe it should be explicitly noted that the belt should be placed into the x-carriage so it is taut. Hey Alan, it shouldn’t be tight at this point - it will be tightened later. I don’t mean tightened, I just mean it should not be hanging. This picture shows that the belt is moving on the “inner side“ the one closer to the motor. The picture in the manual shows it the other way round. Which one is correct ? Using right hand rotate the motor to its original position and hold it (tension is applied to the belt). Using two fingers on your left hand push the belt together. Very small force should be needed for bending the belt, BUT the belt shouldn't be bent by its own weight before being pressed with your fingers, it must be straight. If you are struggling to rotate the motor back into position, the belt tension is too high. Depending on the belt being under or overstretched, adjust the amount of the belt in the X-carriage. When done, rotate the motor to its original position and tighten the M3 screws again. Both top and bottom part of the belt should be parallel (above each other). To adjust the belt position, release the screws on the pulley and move it slightly until you reach the best position. Tighten both screws on the pulley. What should I do if the shift is too far off that the motor pulley shift doesn't fix ? I feel like my pulley is all the way to towards the motor but the belit is still rubbing on the motor bracket. Thus will be rubbing the whole time. where did i screw uP? Perhaps you have mounted the pulley 180* around? Use the technique described below to test if the belt is properly stretched. Use pliers to hold the X-axis motor shaft. Move the extruder towards the X-axis motor. Don't use excessive force. If the belt is stretched properly, you should feel a resistance and the extruder won't move at all. If the belt is too loose, it will deform (create a "wave") and jump over the teeth on the pulley. Belt too loose? Return to step 49 and repeat all steps until now. You have to rotate the motor and retighten the belt in the X-carriage. Shortening the belt length by moving one or two teeth outside X-carriage should be enough. When you rotate the motor to move the extruder toward the motor it should not move? After aligning pulley there was no shaft left for plier to hold. So I had to test belt tension with pulley misaligned (but tightened so it won’t spin on the shaft), and only then align pulley. I held the whole gear of the pulley with my fingers and it worked well enough. “The belt shouldn’t slip, so that also means the extruder shouldn’t be able to move. You need to go back, reread that and actually do it. If you turn the motor shaft and the belt doesn’t slip, then the extruder MUST move. That is tho whole idea behind the belt…….. The shaft turns, therefore the gear turns, therefore the belt moves, therefore the extruder moves…… That shows that it is correctly tensioned and NOT slipping. If the extruder did not move that would mean the belt is slipping or the set screw on the gear is not tight enough (gear is slipping on the motor shaft). Yeah, Filip’s comment does not make sense. If the belt is properly stretched, that means there will not be any slack for the belt to skip, which means turning the shaft should drive the belt thus moving the extruder. Apologies for the confusion, that comment was meant for another guide. Is this comment marked with a black dot still needing correction ? I have now read the instructions 5 times over and I’d say it makes sense. You have to see the pink, blue, and black dot as one block of instructions. You hold the motor shaft with pliers in one hand while trying to move the extruder with the other hand. If it does not move, the test is successful. For the following step we recommend getting a white marker, but you can also trim the belt without it. Measure the part, which must be trimmed and gently take the end of the belt away, from the X-carriage, but make sure at least 3-4 teeth are still in the X-carriage, as you don't want to lose the tension. If possible make a mark, where to cut the belt. Ensure again your mark is in the correct position and the belt is still stretched. Using pliers cut the belt and push it inside X-carriage. Use screwdriver or Allen key, if needed. I had an Exacto knife handy - that was a lot easier than risking pulling out the tension. The exacto knife worked for me as well, thank you for this idea! Trusty sheffield steel swann morton here £10 for a pack of 100 seems wrong not to right? Yes - Stanley knife here. Saves losing the correct position. A flush-cut micro wire cutter worked for me. They have a sharp edge that snips the belt neatly without having to pull much out of the slot. Also perfect for all the zip tie cutting. Had a nice set of snips handy that did the trick. its a better idea to loosen up the belt before cutting it pressing it in, and then positioning the pulley and adjusting the tension. There is a free App called „GatesCarbonDrive“ to check the tension of bicycle carbon belts. It measures the frequency after flipping the belt with a finger. Would give us an objektive reference value - 60hz is what I got for the belt. The frequency changed for me depending on where along the X-axis the carriage happened to be and which side of the carriage I plucked. In this step, we will finish tensioning the belt. Please read the instructions first, your belt might have proper tension already, then there is no need for additional screw adjustment. First, slightly release all the screws holding the motor, otherwise, the upper "tensioner" won't work (the motor must be able to move). ATTENTION !!! BE EXTREMELY CAREFUL WHILE TIGHTENING, YOU CAN CRACK THE PART IF YOU OVER TIGHT THE SCREW. Using Allen key start tightening the M3x18 screw inside the X-end-motor, but after each turn or two check the tension in the belt. For the optimal performance, the belt must be a bit harder to press with your fingers. Move the extruder all the way to the X-end-idler and try the belt tension in the middle of the X-axis. When you achieve optimal tension, please tighten the screws again. In case you experience X-axis failure during calibration or skipped layers in the X direction, you can adjust this screw accordingly. Tightening the screw stretches the belt. Releasing the screw has opposite effect. Each time don't forget to release the screws on the motor first. - Where in the instructions in this step does it tell me what the proper tension is? All I see is that the belt must be a bit harder to press with my fingers… A bit harder than what, I got it fairly tight in the last step, The instructions also mention to tighten the adjustment screw until I achieve optimal tension, but there’s no explanation how I would know when I’ve reached that point. Is it just when the belt doesn’t skip teeth during the test in the step above? A bit more objective explanation of what we are looking for tension wise would be helpful. Hello William, unfortunately there is no objective way to reliably determine the belt tension. The green bullet point gives you the best clue. It should be possible to pinch the belt together but it should not be easy. You will know if the belt tension is correct after the printer passes (or not) the Selftest. Very hard to work out what the correct tension is. What you could do is provide a small weight (component) that when it sits on the top belt, with the motor over to one end, then the bottom of the component should just touch the bottom belt. Or something similar. All this guesswork with the tension, absentmindedly cracked the screw mount on the outside corner thinking I hadn’t retightened it yet… :( Maybe it will still work if I glue it? Epoxy to the rescue! It should be fine. Hey Kevin, sorry to hear this. But yes, epoxy should fix it. And then eventually you can print a new piece (PETG). I have a hard time retightening the outer motor mount screw after I apply tension with the tension screw as it is being pushed by the tensioning screw. If you have any difficulties with tightening the screws in this step, it is likely that your belt is already properly set. This step is not absolutely necessary, and is mostly needed only if you didn’t tighten the X belt well enough in the earlier steps. Once you complete the selftest after finishing your assembly, you can find your belt tension values in Support Menu > Belt Status. If your values are in 240-300 range, your belt is tightened properly. Ugh. Be very careful with this step. And one thing to note - in my case, the tensioner screw wasn’t even tight before the motor mount cracked. So don’t worry about how tight the tensioner screw is - worry about the belt. Even then, don’t worry too much about the belt until you can run the self test.